Online Chapter I: "Knock, Knock"
Excerpt - Chapter I: "Taft! Taft! Taft!" Excerpt - Chapter I: "The Man Who Killed Christopher Marlowe"
Excerpt: "A Machiavellian Discourse on Game of Thrones"
"An Erudite tour de force"
"thoroughly researched facts and captivating fiction"
"I'll never read Macbeth the same way again"
License to Quill is a James Bond-esque spy thriller starring William Shakespeare and Christopher Marlowe during history's real life Gunpowder Plot. The story follows the fascinating golden age of English espionage, the tumultuous cold war gripping post-Reformation Europe, and the cloak-and-dagger politics of Renaissance England. Readers will frequent the same taverns as Shakespeare, test their wits against the infamous Guy Fawkes, witness the miracles of the scientific revolution, and delight in the mysterious origins of the Bard's most haunting play: Macbeth. 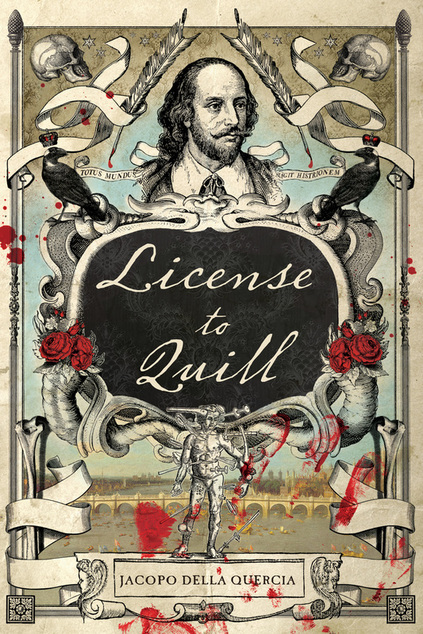 ​Heavily based on real events and extensively researched for accuracy, License to Quill is a sweeping, sometimes frightening immersive experience that will change the way you look at William Shakespeare forever! "AMAZING... ONE OF THE BEST READS OF THE YEAR"
This historical thriller is an equal-parts cocktail of action, adventure, science-fiction and comedy. Our story follows a globe-trotting President Taft and Robert Todd Lincoln in a race to solve a mystery stretching back to the Civil War and the Lincoln assassination. Based on true events, readers will find themselves swept into a vast conspiracy spanning four continents and three oceans during the turn of the century. Fascinating technologies will be harnessed, dark secrets revealed, true villains exposed, and some of the most famous figures in history will take the stage. With surprises lurking around every corner and a vast cast of characters to root for, The Great Abraham Lincoln Pocket Watch Conspiracy is a heart-pounding adventure that only history could have made possible. and book excerpt Available Here!